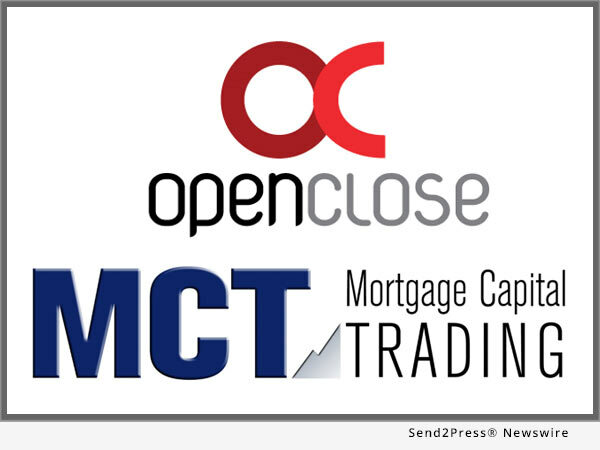 NEW YORK, N.Y., May 16, 2016 (SEND2PRESS NEWSWIRE) — MBA National Secondary Market Conference & Expo – OpenClose® an enterprise-class, multi-channel loan origination system (LOS) provider, announced that in conjunction with Mortgage Capital Trading, Inc. (MCT) it has developed a solution that normalizes and extracts a lender’s committed loan sale and purchase advice data to be uploaded directly into OpenClose’s LenderAssist™ LOS, thus eliminating significant manual intervention. Depending on the number of loans that have been executed, time savings can be reduced from days to minutes. The solution works by MCT converting large committed loan sale reports or purchase advices into normalized datasets, which is then automatically transmitted to the lender for easy upload into OpenClose’s LenderAssist™ LOS. All of this transpires with the simple click of a button. “MCT is committed to providing innovative solutions with our technology partners that enable work efficiencies and cost savings for our mutual clients. This interface delivers on that promise,” says Chris Anderson, chief administration officer at MCT. Founded in 1999 and headquartered in West Palm Beach, Florida, OpenClose® is a leading multi-channel loan origination system (LOS) provider that cost effectively delivers its platform on a software-as-a-service (SaaS) basis. The company provides a variety of 100 percent browser-based solutions for lenders, banks and credit unions. OpenClose’s core solution, its LenderAssist™ LOS, is completely engineered by OpenClose using the same code base from the ground up, thus avoiding the problems that often accompany assembling best-of-breed applications or acquiring disparate technologies in an effort to create an end-to-end platform. The company provides lending organizations with full control of their data and creates a truly seamless workflow for comprehensive automation and compliance adherence. For more information, visit http://www.openclose.com/ or call (561) 655-6418. Mortgage Capital Trading (MCT) is a capital markets-focused risk management and advisory services company providing independent analysis, training, hedging strategy and loan sale execution support to clients engaged in the secondary mortgage market. Founded in San Diego, California in May 2001, the company has expanded to include field sales and support offices in Philadelphia, Dallas, San Francisco and Charlotte. MCT is a recognized leader in the industry and currently supports more than 150 clients on the HALO (Hedging And Loan sales Optimization) Program. The company also develops and supports MCTlive!™, an award-winning real-time, trading and best-execution secondary marketing platform. MCT’s LockCentral™ is the industry’s largest outsourced centralized lock desk service. For more information, please visit http://www.mct-trading.com/ or call (619) 543-5111.